This vegetarian recipe can be served over rice as an entree or, thinned with vegetable broth, it can double as black bean soup. 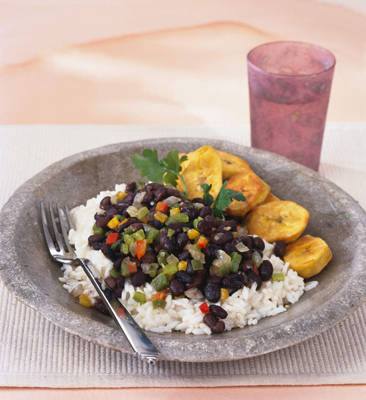 This flavorful, hearty dish goes well with a green salad and fried plantains. In a large skillet, heat the olive oil. Cook the onions, green bell peppers, celery, and garlic in the oil over medium heat until the onions are translucent (about 10 minutes). Add the beans, salt, bay leaf, cumin, oregano, and lemon juice and stir well to combine. Cover and simmer for another 35 or 40 minutes, stirring occasionally to prevent sticking. Remove the bay leaf and serve over rice. Per serving: Calories 195 (From Fat 63); Fat 7g (Saturated 1g); Cholesterol 0mg; Sodium 593mg; Carbohydrate 25g (Dietary Fiber 9g); Protein 8g.